Contact us or give us a call. According to one story, 11th century Danish monks studying at St Albans Abbey, then a Benedictine Monastery, took the bones of St Alban with them when they returned to Odense and placed them in the crypt of their new church of Saint Alban (Sct Albani Kirke). A rival legend suggests that the complete skeleton of St Alban was taken to Cologne in the 10th century. A shoulder blade from this skeleton was returned to St Albans Abbey in 2002. However, it now seems likely that the bones were first taken to Ely for safe-keeping and were indeed later moved to Odense. Be that as it may, the origins of the Hertfordshire Anglo-Scandinavian Society are bound up with those of the town-twinning link through the prime mover in both cases, Count Ove Scheel, who had come from Odense to work in London in 1926. (See below for a brief biography). Like many Danes, Count Scheel was exiled from his homeland during the Second World War. 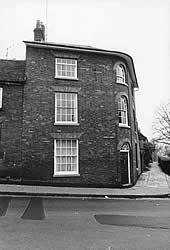 He came to live in St Albans after being bombed out of his London flat and retiring from his post as a director of the London branch of Thomas B Thrige. On 9th April 1940, the day the Nazis invaded Denmark, he and his Swedish wife Anna opened the Little Mermaid Restaurant on the first floor of the building which stands at the junction of High Street and Chequer Street, thus creating an informal meeting-place for Danes separated from their homeland. 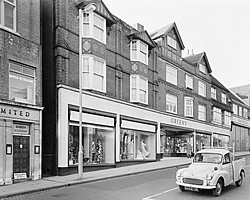 The idea of formally setting up an Anglo-Danish Society and a town-twinning link with Odense was floated at an official dinner at Batchwood hall, when St Albans hosted a delegation from Denmark in June 1963. In her book The Story of St Albans, Dr Elsie Toms recalls that a party from St Albans City Council had already visited Odense in 1961. 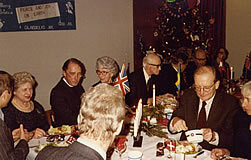 The inaugural meeting of the Anglo-Danish Society was held on 29th February 1964 at the Little Mermaid. The Mayors of Odense and St Albans were invited to be the Joint Presidents and Count Scheel became Vice-President, a post he held until his death in Odense on 22nd May 1986. 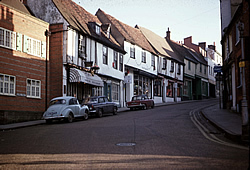 Later it was decided to change the name of the society to the Hertfordshire Anglo-Scandinavian Society, as people from the other Nordic countries and other towns in Hertfordshire participated in the meetings. Pastor Poul Erik Fabricius, who was for many years the priest of the Danish Church in London, succeeded Count Scheel as Vice-President of the society, an office he continued to hold until his death in April 2010. 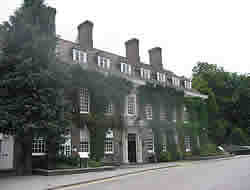 Early meetings continued to be held at the Little Mermaid, but later the Society moved to the Abbey Institute in Romeland. One of the highlights of the Society’s social calendar was the Julefest (Christmas Celebration), when a carol service was held in the Lady Chapel of the Abbey, followed first by a children’s party, and later in the evening a party for adults. Count Scheel always provided a Christmas tree. In 1970, the Society meetings moved to the boardroom of the newly built Diocesan Offices on Holywell Hill, where they remained until the 1990s, when they transferred to the present venue of St Mary’s Church Hall, Marshalswick. The tradition of the Julefest is now firmly established, with the Pastors of the Scandinavian Churches in London being invited in turn to conduct the short service together with the Vicar of St Mary’s. After the service, we enjoy a warming glass of glögg, followed by a cold meal. 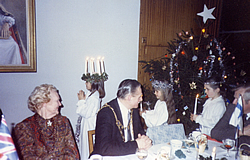 As the meal ends, a traditional Swedish Santa Lucia procession makes its way around the tables, after which the children taking part are presented with a small gift by the Mayor. Then we are entertained with Scandinavian songs and carols sung by Beryl Foster and a small choir. Originally members provided the food, but now outside caterers are employed. Society meetings are now usually held on the second Wednesday of each month from September to May, with speakers, films and quizzes, usually on Scandinavian or local topics, followed by a cosy chat over coffee and cakes or savouries. A summer outing complete with afternoon tea has become another of the Society’s traditions. In the old days, people met socially in between official meetings, a tradition we are currently trying to revive. Summer outing to Capel Manor, 1998 Although we have never been an official town-twinning organisation, we have not lost sight of the link with Odense. In 2002, three officials of the Society visited Odense, where we enjoyed a guided tour of the city and visits to the city archives and the Christiansminde Kolonihaver (Danish-style allotments) on the outskirts of Odense. Michael Gill and Elaine Fairey (then chairman and secretary) with the Head of the Odense Allotments Society, 2002 The Society continues to provide a focus for Scandinavians living in Hertfordshire and local people with an interest in Scandinavia and acts as a contact point for St Albans City Council on the occasion of official visits from Odense. History compiled by Elaine Fairey, Aage (Andy) Mikkelsen and Rae Walter. Educated as an engineer at the Polyteknisk Læreanstalt in Copenhagen (now the Technical University of Denmark). After retiring from this post became a restaurateur, first in London and then in St Albans. 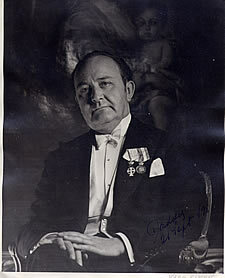 For 50 years, Count Scheel was also the representative in Britain of Dansk Samvirke (Danes Worldwide). Awarded King Christian X Freedom Medal for wartime services. Awarded the Order of the Dannebrog by the Danish Queen in recognition of his services to the Danish community by offering friendship to the Danes in Britain during the war years and by promoting Danish culture. 02.07.1986: Ashes interred in the grounds of St Albans Abbey. 1922 - joined the firm of Thomas B Thrige A/S, Odense. 1926-1940 - Director of the London branch of Thomas B Thrige. 1980 - Returned to Odense.